Days after brutal poisoning of at least 16 stray dogs in capital Ankara, which echoed throughout Turkey, dozens of other strays found killed Saturday in another suburb, angering locals and animal rights activists. 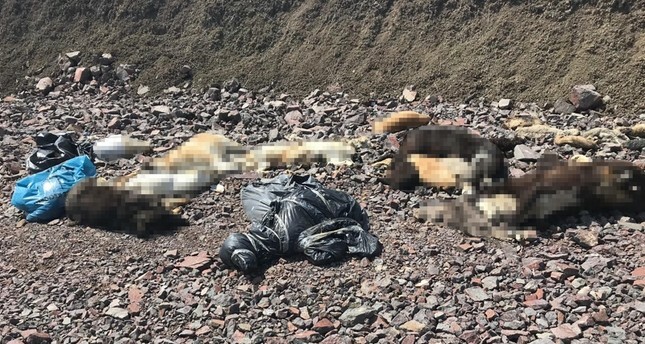 A written statement by animal rights association HAYKURDER said that tens of dead stray dogs were found inside trash bags in an empty plot near the Yıldırım Beyazıt University campus in Çubuk district. HAYKURDER Chairman Erman Paçalı said that many activists and association representatives arrived at the scene. "We don't know what their cause of death is, or who threw these bodies here but we are afraid that this is a new massacre," Paçalı said, adding that the only way to stop these massacres is to materialize the long-sought legislation against animal cruelty. Çubuk Mayor Baki Demirtaş told Ihlas News Agency (IHA) that the municipality detected at least 26 strays, including 16 puppies, were found killed in this incident. Initial investigation by municipal crews and veterinarians points that the dogs were killed 10 to 15 ago, Demirtaş said, adding that the local directorate of the Ministry of Agriculture and Forestry will carry out an autopsy upon their request and the district prosecutor's office launched an investigation into the matter. Demirtaş vowed to follow up on the issue to bring those who are responsible for this atrocity. Alper Karmış, who chairs another animal rights association, told Demirören News Agency (DHA) that a total of 30 dogs including two pitbulls and a rottweiler, and two cats were found dead in the area. The incident in Çubuk came days after 13 stray dogs found dead by poisoning Wednesday in a park in Batıkent suburb of Yenimahalle district. 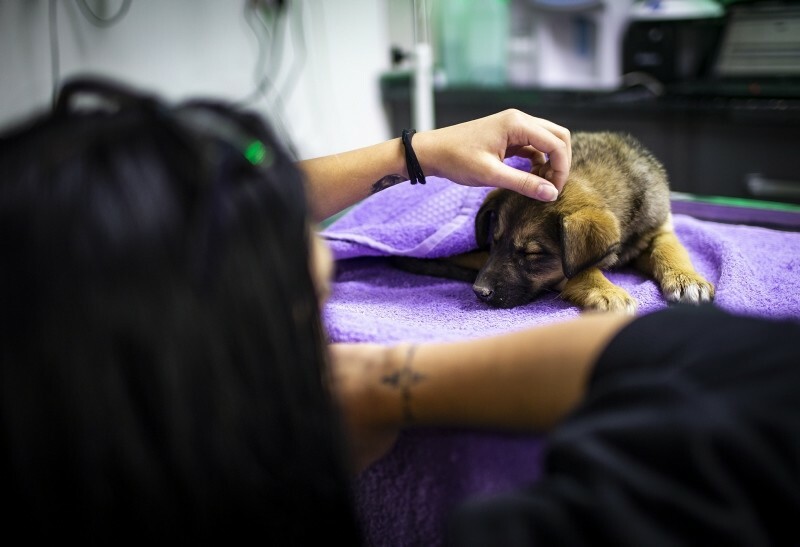 Three others died while receiving treatment as veterinarians and activists managed to rescue eight others. The footage showing the dogs in agony as locals rushed to the scene caused a public uproar throughout Turkey. An investigation found that the dogs, which were being fed by locals in the park, died due to eating poison-added chicken meat thrown out from a white automobile. Three people related to the incident were detained but released Friday under judicial control. Activists who gathered in front of the courthouse reacted against the ruling with some crying and others trying to attack the suspects. One of the suspects was found to be living in the neighborhood and disliked the dogs, and paid two others to poison them. However, the suspects denied the accusations, accepted that they gave the meat and bones to the dogs but claimed innocence. The court ruling was protested by Batıkent locals on Friday. Buket Özgünlü, a resident who used to feed the stray dogs, told Demirören News Agency (DHA) that the suspects released by the court were threatening her every day. Both Ankara Metropolitan Municipality and Yenimahalle Municipality condemned the incident and stated that they wanted be a party in the lawsuit. Despite a consensus on the issue, a draft bill foreseeing prison terms for crimes against animals proposed to the cabinet by relevant ministries is still pending in the parliament. Unfortunately, the back-to-back incidents in Ankara were no coincidence, with reports of cruelty against animals emerging from throughout the country in recent On Friday, locals in Ayvacık district of northern Samsun province reportedly found suspects driving in a pick-up bearing the municipality logo poisoning stray dogs and loading them onto the pick-up inside trash bags. Locals filmed the incident and prevented the suspects, claimed to be municipality workers, from further poisoning. Ayvacık Mayor Halil Kalaycı stated Saturday that he ordered an investigation into the incident, saying that the municipality had no such order. In Keşan district of northwestern Edirne province, locals found Thursday a stray dogs shot by a hunting rifle, rushing him to the veterinary for treatment. Again on Thursday, 10 hunting dogs were found dead by poisoning by their owner Hüsnü Çetin in a village in Tavşanlı district of central Kütahya province. Çetin, 34, told IHA that he was taking care of the dogs for the last five years and he had no problems with anyone in the village. Saying that the dogs were killed when he was out of the village, Çetin said some 10 other dogs were also poisoned in the village. Local gendarmerie units launched an investigation into the incident. Meanwhile in southwestern Burder province, the governorate said Thursday that the local directorate of Nature Protection and Natural Parks found some 15 dogs and a cat buried inside plastic bags near the animal shelter operated by the Burdur Municipality. Many dead animals were previously found by local animal rights activists in the area, notifying authorities. The governorate fined the municipality and demanded personnel related to the incident to be detected and punished. Burdur Municipality also released a statement, saying that an investigation is ongoing.